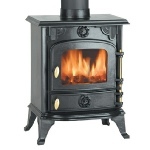 ﻿ Suppliers of cast iron stoves and wood burner stoves to the UK market. 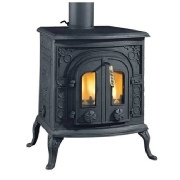 Welcome: As the name suggests we sell a full range of cast iron stoves and wood burning stoves, with a complete range of accessories for all these products. 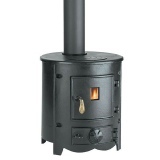 You can find a full range of cast iron stoves and wood burners if you visit our products pages. Our prices include vat and delivery to any mainland UK address. If you have a question on any of our cast iron stoves or wood burners, please give us a ring and we shall try our best to help. Esse are a UK manufacturer of cast iron stoves inset fires and some very grand cooking ranges to name a few of their products. Take a look at their website http://www.esse.com/ for more information with regards their products. They have a very interesting history as the founder moved from America to set up the business in Scotland. 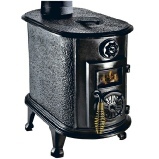 Cast iron stoves come in a great range of sizes and heat outputs. We like to think our range gives you a wide choice of styles to suit your needs. The cast iron stoves that we sell are sourced from suppliers that can give a full back-up to these products in the future. So if you needed a spare part for your cast iron stove in the future these will always be available. If you’re looking for a great focal point to your living area, few heating sources can provide the ambience of a cast iron stove. 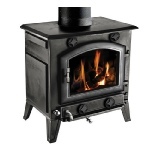 You can use either coal or wood as fuel in all our cast iron stoves to give you added flexibility. Most of the models have features such as air wash cleaning of the front glass, so you can always see the warm glow of a real fire rather than a blackened front glass, most of the cast iron stoves that we sell have a mechanism to adjust the fuel burn rate to give you full control of your fire. We like to think we are a little different and are able to provide the service and back-up that you would expect when you purchase one of our cast iron stoves and wood burner products. So, rather than being an Internet only business, you can visit our showroom and see a full range of our cast iron stoves that are on display. 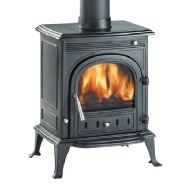 Two of our most popular products are the Clarke Barrel cast iron stoves and wood burner and the Clarke Regal wood burning stove, these two models are always in great demand. 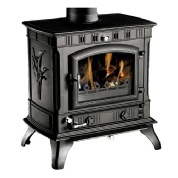 Clarke have a reputation for providing quality products with great service back-up and hence this is why we sell their range of cast iron stoves and wood burners. Features on our wood burning stoves include an air wash system to keep the front glass clean, hence you get to enjoy the ambiance of being able to see your real living fire and not just a blackened front glass. All models have the ability to adjust the rate at which the fuel is burnt, either via a damper or air control valve. 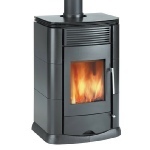 If you take a look at our accessories page you can find a full range of flues, elbows and soot boxes to fit our complete range of wood burners and cast iron stoves. 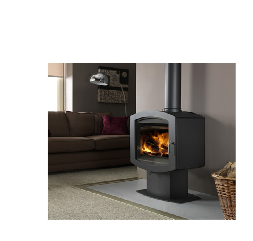 All our wood burning stoves are dual fuel so you can use either coal or wood as the fuel supply making our range of cast iron stoves and wood burning stoves very flexible. 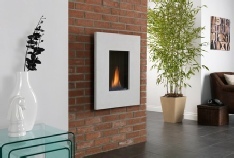 If you take a look at the various models of cast iron stoves and wood burner stoves some models have their own unique features. Take for instance the Boxwood and Parlour models, these have removable cooking plates should you feel the need to do your own cooking. The Thames cast iron stove from Clarke has one of the smallest footprints in our stove range, and is ideally suited to provide the heating source for house boats. We also sell a full range of accessories to fit all our wood burner stoves, from flues of different lengths to soot boxes and elbow pieces. All our wood burner stoves come with full installation instruction on how to fit these products. If you have a small workshop and want to economically heat the premises without it costing a fortune the Broughton range of fan heaters are worth looking at. The smallest model in the range is the FF3 fan heater, this is a robust electric fan heater with a 3Kw output. 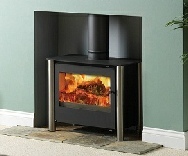 The manufacturer Broughton also offer a 2 year guarantee on this heater. We often get asked for recommendations for suppliers for heating products for industrial premises. Often specialist advice is needed to make to make sure the correct type of heating product is selected for its intended purpose. From our experience one of the best suppliers of heating products is a company called Saturn Sales Limited. They have a great deal of expertise in these types of products and are happy to offer advice on their product ranges. If you have a draughty warehouse with poor heating take a look at the range of warehouse heaters available from Saturn Sales. There are a wide variety of types to suit any size of warehouse. These heaters over low maintenance and low running costs to keep your heating bills low. Two new heater models you may be interested in have come on the market, a new model from the manufacturer Broughton based in the UK, this is the FF29 fan heater which offers the option of having 4 ducted outlets fitted. Another new heater to the market is the FF12 industrial fan heater which is self contained and runs of most electrical supplies fitted into industrial units. Each of these new models also come with a manufacturers 2 year guarantee giving peace of mind to the buyer. I tried and tested three phase electrical supply heater is the Broughton FF23 heater which is ideal for garage premises and is rated at 23 kilowatts output.